Techniques by Trish: Scrappy Mom Spectacular! I hope that you had a great week and are enjoying the weekend!! I'm having a great weekend.....my cousin, who is like a brother to me, surprised me and showed up in Florida on Thursday!!!!! He and my sneaky hubby planned the whole surprise and it was amazing! So we have been going out and today we'll be going to the beach. Anyways....If you guys haven't seen Scrappy Mom's is officially 1 year old!!!! AND Scrappy Mom's Tammy & Mel are giving away spectacular give aways every day for the next few days! Be sure to check head over to the Scrappy Mom Blog for all the information. 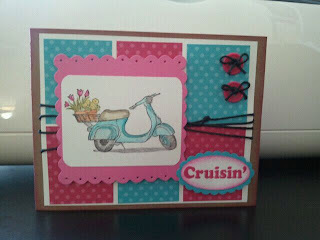 Here is my project for the Scrappy Mom Spectacular using the most recent set SunKissed!! Hope you guys enjoy the card and have a great weekend!! Hey Trish. I feel like I have not been over here in forever. I love this card. Great colors! Love the image and the sentiment too. So much fun. I hope you have a great weekend. This is so cute. I love the colors. Very cute, Trish! I love the image and your coloring! Pretty card! Love the colors. Thanks for sharing. SUPER DUPER cute Miss Trish!!! Love the card and how you used the twine on the buttons!